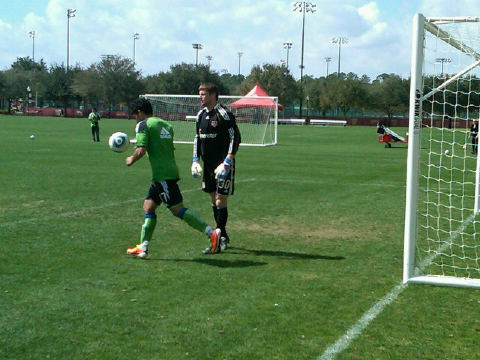 Training game against the Houston Dynamo from ESPN Wide World of Sports Complex in Orlando, Fla.
45: Fredy Montero lobs a free kick into the box, but it goes away for a goal kick ... right as the whistle sounds for halftime. Tally Hall has yet to allow a goal in six preseason games. Montero's volley nearly ended that run. Didn't hear about much from Evans in the first half (other than the yellow card). How has he been so far this game? Pretty good, to be honest. He's definitely a vocal element to the midfield. Mantano could use a lot more time in CONCACAF and open cup in place of estrada, jaqua or even fernandez as he seems to serve the ball in very well. Plus he has the heart, you can see it on his face. @Matt Gaschk Yeah, I am pretty bummed the AC St. Louis folded. It was nice to have some professional soccer in the city. But I will settle for cheering the Sounders on from a distance. Dan: Although I agree with you on that point. Tough to see so few get protected in that process. Theres no way to protect all of the potential we have. Matt's right again... enjoy the present, because that's what we have. I agree ... yes they are. They are a tough combination to crack. Josh Ford is in net for Kasey Keller to start the second half. It looks like Houston may be going with a whole new lineup. Houstons lineup: Tyler Deric, Jordan Graye, Eddie Robinson, Jermaine Taylor, Mike Chabala, Francisco Navas Cobo, Lovel Palmer, Alex Dixon, Corey Ashe, Brian Ching, Jason Garey. 48: Lovel Palmer shoots and misses just over the crossbar for a goal kick. 48: Jeff Parke makes two sliding stops to stop the Houston attack. Is Ford our only change? 52: Brian Ching tries to pass into the box, but Jeff Parke defends it away again. Matt, which of the rookies has impressed you most in pre-season/this game? Of the drafted players, I've really liked the two keepers. Carrasco played very well yesterday, too. 54: Mike Chabala takes down Alvaro Fernandez for a foul at midfield on the right side. Read the blog at SoundersFC.com for the statement about Forlan. 56: Great run by Steve Zakuani up the left side and he finds Fredy Montero for a header, but Tyler Deric makes the save after initially stumbling on it a touch. Great opportunity from Seattle, though. Are you going to go to Disney World while you're in Florida? I think the plan was to go yesterday, but we've scratched that plan. 61: O'Brian White is tackled in the box to earn a PK. The ref takes a minute to make the call, but eventually rewards the penalty. 62: Seattle gets on the board. 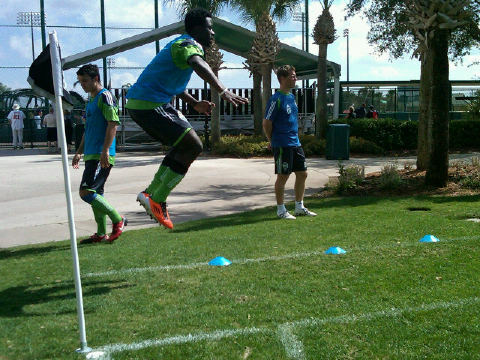 O'Brian White earns a PK and Fredy Montero puts it away. Houston 2, Seattle 1. 63: New lineup for Seattle. Ford, Richard Martinez, Taylor Graham, Leone Cruz, Michael Tetteh, Roger Levesque, Servando Carrasco, Jonathan Prieto, Miguel Montano, Pat Noonan, Lamar Neagle. 68: Seattle lays the pressure in the offensive end, but can't get a shot out of it. Jonathan Prieto sends a cross from the left side, but it goes away for a corner. 70: Michael Tetteh scores his first goal for the Sounders, racing up the middle and going give-and-go with Roger Levesque to score 2-2. 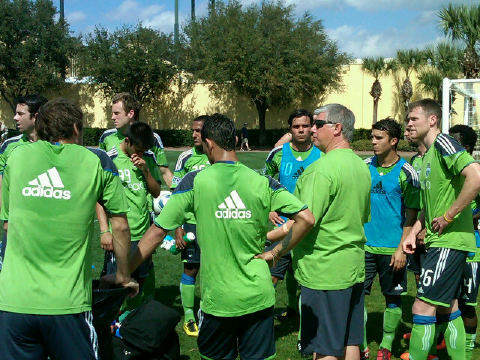 I remember Sigi and the team stressing the need to score more goals this season, and that this team can do it. Also stressed that to win the Shield/Cup/CCL we need to score more regular season goals, goals per game, goals in training/drills/PERIOD! Where are the goals? We need to start stringing goals together now so it becomes infectious. Sigi quote: "We’re the first expansion team to win a trophy in each of our first two years, that’s a great accomplishment. But in four playoff games we have scored one goal so we need to score more goals in the playoffs. To score more goals in the playoffs, we need to score more goals in the regular season. To score more goals in the regular season we need to score more goals in practice. This is the year that if we don’t accomplish some of the things we feel we can accomplish then you got to start looking at breaking up that core. So, this is an important year."